Like to race against the evil? Here’s the latest ben 10 running game you can play online – Ben 10 Rustbucket Rescue! Run across the Nevada Desert aka Death valley and chase the evil Cecile who has stolen Grandpa’s Rustbucket. And ultimately attack and destroy his alien creation Magg-o-net to save the city! 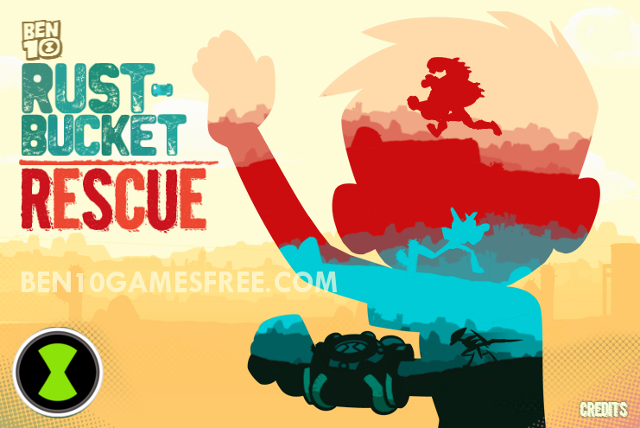 As the name suggests, the Ben 10 Rustbucket Rescue game is about saving grandpa’s van. The half-roach villain Cecile is pretty smart and he is trying to escape in the Rustbucket. On the other hand, he has also created a monstrous alien, Magg-o-net, who is invading the city and killing everything that comes in the way. It’s only Ben 10 and the three aliens – XLR8, FourArms and Diamond Head – who have the responsibility to save the city. Recommended: Play Ben 10 Ultimate Alien games online now! Talking about the game play, Ben 10 Rustbucket Rescue has only three stages that you have to complete with three different aliens. The very first stage is a chase across the death valley desert and you have to play with XLR8. We all know XLR8 is known for its lightning fast speed. So, you just have to run avoid all the obstacles coming in your way. Remember, if you hit any obstacle like rock, tires, pipes or debris, you will get slowed down and would not be able to catch Cecile & the Rustbucket. In the second stage, the rush becomes even harder. There will be alien attackers and the obstacles too. But to tackle all this, you will have Ben 10 Diamond Head. Remember, you can shoot and destroy the rocks or aliens to clear your way in this level. Pro Tip: While Running, don’t forget to take the Turbo boost to accelerate even faster. The final stage comes with the monstrous Magg-o-net attacking the city with rocks and you have to save the city and kill the monster. We might ask how? Well, you have one of the most powerful Ben 10 alien – Four Arms – with you. All you have to do is to hit the rocks back to the monster and kill it. Guys, that’s all. Now, its time for you to get going after the rustbucket and save the city. With XLR8, Four Arms & Diamond Head, Chase the stolen Rustbucket & Rescue the city to Win! Good Luck!! Don’t Forget to give your rating for Ben 10 Rustbucket Rescue game and share your tips and tricks to win this game in the comments section below.